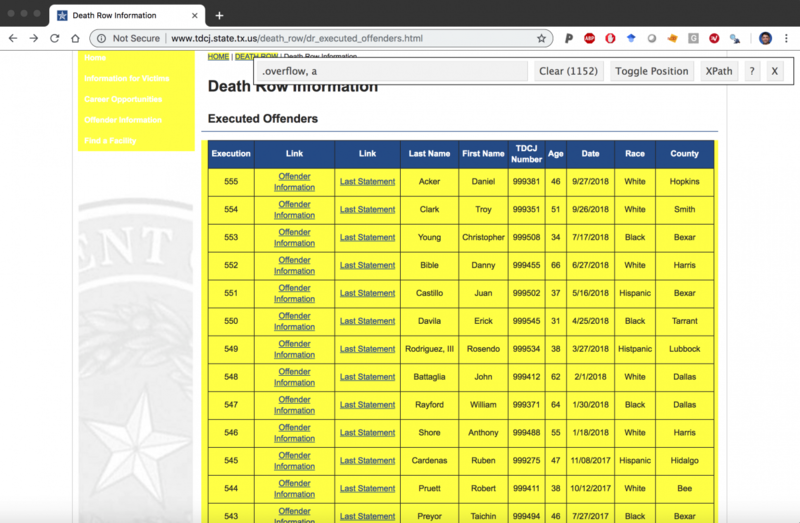 The Department of Criminal Justice in Texas keeps records of every inmate they execute. This tutorial will show you how to scrape that data, which lives in a table on the website and download the images. The tutorial uses rvest and xml to scrape tables, purrr to download and export files, and magick to manipulate images. 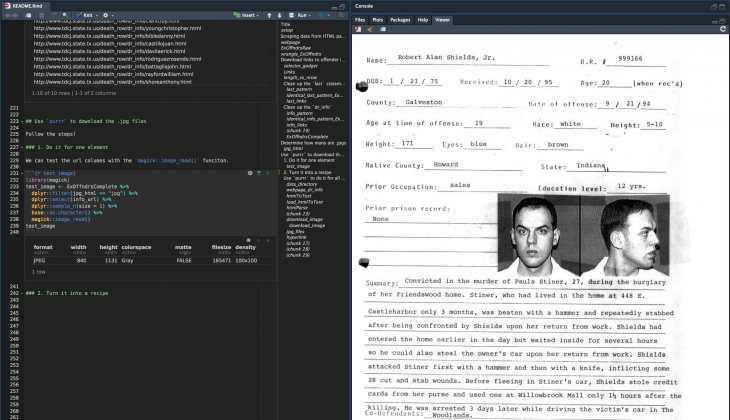 For an introduction to R Studio go here and for help with dplyr go here. Load the xml2 package and define the url with the data (here it’s webpage_url). Use the rvest::html_table() and tibble::as_tibble() to put the content into a tibble. …so we will have to go back to the webpage to find these. It also looks like the Race variable has a misspelling. Collapse the Histpanic level into Hispanic. Identify the links using the selector gadget. Download the selector gadget app for your browser. In order to get the links from the table, we need to pass webpage through a few passes of rvest functions (html_nodes and html_attr) with various css tags to get the correct url paths. This takes some trial and error, but eventually I was able to figure out the the correct combinations to get the links to the pages. 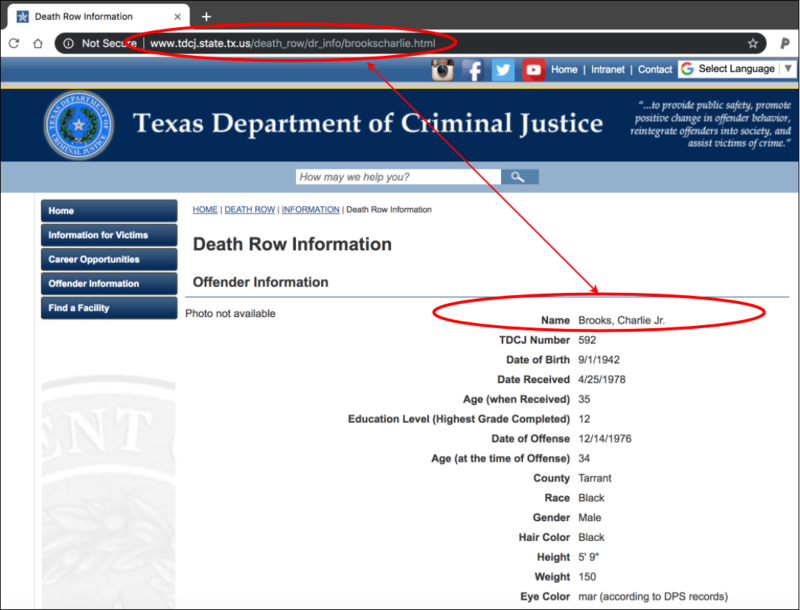 A dr_info/ path (which makes the entire path "http://www.tdcj.state.tx.us/death_row/dr_info/"). Every offender has two links–one with their full name, the other with a last string attached to the back of their full name. Something tells me if I check the base::length() of Links with the base::nrow()s in ExOffndrs…there will be twice as many links as rows in executed offenders. Good–this is what I want. That means each row in ExOffndrs has two links associated with their name. The stringr package can help me wrangle this long vector into the ExOffndrs tibble. Subset the Links for the last_pattern, then tidy this vector into a tibble column. Finally, add the first portion of the url used above. Test one of these out in the browser. Now I want the offender information links (so I omit the links with last in the pattern). Repeat the process from above. Note the different file extensions! This is an .html file. Now we assign these links to the ExOffndrs data frame. But first make sure they match up. Create a binary variable to identify if this is a .jpg or .html path and name the new data frame ExOffndrsComplete. Use dplyr::sample_n to check a few examples of this new variable. Check count to be extra sure. Follow these three purrr steps from the workshop by Charlotte Wickham. We can test the new url columns in the ExOffndrsComplete with the magick::image_read() funciton. You should see an image in the RStudio viewer pane. Put these urls into a vector (jpg_url), then create a folder to download them into (jpg_path). Now use the purrr::walk2() function to download the files. How does walk2 work? First look at the arguments for utils::download.file(). The help files tell us this function is “specialised for the two argument case”. the function we want to iterate over .x and .y (download.file). This tells R to go the url, download the file located there, and put it in the associated /jpgs folder. This might take awhile, but when its done, check the number of files in this folder. There you have it! 377 images of downloaded offenders! We should have two datasets with the following counts. 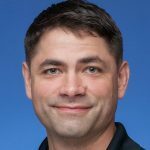 These are new experimental functions from dplyr, and a big shout out to Luis Verde Arregoitia for his post on a similar topic. The dplyr::group_split() “returns a list of tibbles. Each tibble contains the rows of .tbl for the associated group and all the columns, including the grouping variables”, and I combine it with purrr::walk() and readr::write_csv() to export each file.